Hair conditioners are still number one among endless amount of conditioning products for hair. There are various types (restoring, moisturising, styling, protecting and many others), numerous manufacturers and hundreds of nutritional ingredients. Sometimes this choice is overwhelming. Therefore, it is no wonder that we usually buy on impulse and choose a cosmetic which has attracted our attention with an interesting advertising catchword or packaging. Few of us read the ingredients of hair conditioners. It is high time to change it! If you want to get a conditioner which is suitable for your problem, you must know what to look for. We are presenting the most important information about different conditioners suitable for various types of hair. Hair maniacs say that the most crucial thing is that you can get effective hair care only by choosing proper product for the needs of your hair. Ingredients are important as they provide hair conditioners with their properties. How to choose a conditioner suitable for your hair? DELICATE AND THIN HAIR – requires use of conditioners which add volume. These should always be rinse-out products with light formula. Leave-in conditioners may weigh thin hair down and make it oily. You should go for moisturising and nourishing ingredients and, most of all, conditioners that offer strengthening. OILY HAIR – one of the most problematic hair type. If you apply an improper product, hair can get sticky and weighed down. You cannot use leave-in cosmetics. It is recommended to use rinse-out conditioners of light formula, preferably with cleansing properties. HAIR WITH DANDRUFF – such hair also prefers rinse-out conditioners. You must rinse it thoroughly as any excess product on hair makes the problem even worse. The best for dandruff hair are purifying, refreshing conditioners which contain herbal extracts (e.g. from horsetail or nettle) and products which offer antimycotic properties. DAMAGED HAIR – you need to be choose special care for damaged hair as you must get rid of damages, provide protection and close hair cuticles. The best idea is to choose conditioners designed for damaged, coarse and dull hair. Such products should contain proteins, vitamins and lots of plant extracts (e.g. from cotton, silk, cashmere). The conditioner should deliver regeneration, strength and protection. CURLY, FRIZZY HAIR – products that weigh hair down, define curl and have strongly concentrated formula are suitable for this type of hair. It is important to use deeply moisturising and nourishing conditioners because curly and unruly strands tend to get dry. DYED HAIR – most of all needs moisturising and nourishing as in the process of colourization hair gets really fatigued. The conditioner must be designed for dyed hair and have restoring properties. Products which protect hair and prevent colour from fading are also worth applying. DRY HAIR – usually lacks shine. It is a good idea to apply hair conditioners which offer strongly moisturise, soften and add shine. Strengthening ingredients are also important. They restore dry hair, make detangling easier and improve the condition of strands. Which one is better: hair conditioner or hair oil? Despite having many advantages, no hair conditioner will provide as comprehensive effects as a well-matched hair oil. While discussing truly effective products, hair oil is definitely number one. It matches hair structure and needs, it is based on the best natural oils, free from sulphates, parabens, silicones. Sadly, hair conditioners are much weaker and heavier for your hair. If you are wondering which conditioner to choose, pay attention to oils as well. They can prove to be more suitable for you and help you change your hair completely with long-lasting effects and in a natural way. Your favourite conditioner weighs your hair down? No wonder it does. It contains lots of silicones, artificial and comedogenic ingredients. Even if the conditioner is organic, it can weigh hair down due to its typical consistency – thick and creamy. There is no hair oil that causes oiliness or reduces volume. If an oil is properly chosen in terms of fatty acids, it penetrates your hair and works wonders. You don’t know what to do about your dry scalp? Hair conditioners will fail because they contain lots of ingredients that can harm your skin. They clog pores, cause irritation and upset the scalp. Hair oils turn out to be far better. They are the only products that you can apply both to your hair and scalp. No worries about oily hair or scalp, etc. Effects delivered by conditioners last until the next wash? Sadly, it is the result of products covering hair with a protective and smoothing layer. Hair conditioners bring an instant shine and softness yet the effects are not at all long-lasting. Hair oiling is much more effective because oils penetrate your hair, reinforce its natural lipid coat responsible for proper hydration. They also contain fatty acids that are crucial for hair. Matching an oil to hair structure is the key. Check why hair oiling is better with an example of a perfect hair oil! A conditioner is a key element in hair care – it is the second stage (nourishing). If we have already learnt how to choose a conditioner suitable for our hair type, the problem is much smaller and it will be easy to pick the products good for our hair. Another thing that might be troublesome is applying the conditioner. How is it applied for best effects? Many of us aren’t aware of the mistakes that we make at this stage of hair care. There are several of them. Below you can read about the most important rules that have to be followed in hair care. The rules are found in many handbooks and on blogs. Always choose a type of conditioner that is suitable for your hair type. Never apply too much conditioner at a time. Apply the conditioner only from the roots to the ends. Avoid rubbing the conditioner in the scalp. Leave the conditioner for the time that is indicated on the packaging. Remember to always rinse the conditioner thoroughly. If you have oily hair, nourish only the ends. Always brush your hair before the application of the conditioner. Wrap your head with a warm towel to enhance the action of the conditioner. Avoid applying more than one conditioner at a time. We already know what type of conditioner to choose and how it should be applied. Now, we can go hunting. A hair conditioner is essential to keep the proper condition of hair. It is a product which should be found on every shelf and in every vanity case. We should bear in mind that the conditioner won’t repair severe damage but it will improve the appearance of hair effectively and provide it with protection. We would like you to take a look at the ranking of the most popular hair conditioners of latest months. Everybody will surely find something suitable. Every conditioner has been described according to the same criteria, taking into consideration what is the most important in hair products to the customers. Moroccanoil is an Israeli brand which has revolutionized the market of hair care products. Moroccanoil products are enriched with antioxidants and nutrients. They offer intensive action and easy application. They are used by professionals in the biggest hair salons and are popular among women all over the world. Moroccanoil Smooth Conditioner – who is it for? Moroccanoil hair conditioner is universal. It is mainly designed for unruly and frizzy strands. It is called an immediate rescue for damaged hair. It works perfectly for dull, dry, brittle and weak hair. It can also be used for dyed hair. Moroccanoil Smooth Conditioner – what are the ingredients? Moroccanoil smoothing conditioner owes its performance to natural and concentrated ingredients. The basic ingredient of all Moroccanoil cosmetics is highest quality argan oil and argan butter. The conditioner is additionally enriched with a patented Amino Renew™ which is supposed to make up the deficit of amino acids. The formula is free from sulphates, phosphates and parabens. Moroccanoil Smooth Conditioner – what effects does it bring? The main task of Moroccanoil Smooth Conditioner is the restoration of hair suppleness. It offers purifying properties and makes detangling much easier. It is all thanks to the formula suitable for frizzy hair. The damage in hair fibre causes frizzy and tangled hair. AminoRenew™ complements the deficit of amino acids, supporting the restoration of damaged hair. Therefore, hair root becomes smoother and even. Regular application of Moroccanoil treatment provides immediate and long-lasting nourishing. The strands are smooth and brushing is easier. Moreover, it restores natural and healthy shine. It makes up the deficit of all nutrients. 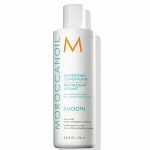 Moroccanoil Smooth Conditioner – how to apply? The application of Moroccanoil conditioner is trouble-free. Wash your hair, get rid of excess water and apply the product. Spread the conditioner from the middle length of hair to the ends. Leave the cosmetic for more or less two minutes so that nutritional ingredients can penetrate inside the hair. We must keep in mind that regular use will bring best effects. Moroccanoil Smooth Conditioner – is it effective? Moroccanoil Smooth Conditioner is an effective product. Most online opinions about the product are similar. The effectiveness as well as very characteristic and pleasant scent are usually emphasized. If we nourish our hair with the use of this product, our strands will get soft, shiny and easy to style. Unruly strands are tamed, hair is more straight and smooth; frizz is reduced. However, the conditioner doesn’t provide restoration and regeneration of seriously damaged hair because its action is too weak. Moroccanoil Smooth Conditioner – where to buy? Moroccanoil conditioner is available at many online stores and drug stores. The manufacturer doesn’t run its own online shop. The advantage of Moroccanoil conditioner is natural argan oil among the ingredients. The product is effective but it doesn’t fulfill all promises of the manufacturer. It has a nice fragrance and the application is easy. The price of the product is higher than its quality, which is surely a disadvantage. L’Oreal is one of the most popular French brands which is a leader among world cosmetic brands. L’Oreal Paris products are usually regarded as luxury cosmetics available for everyone. Hair care cosmetics offered by the French company are technologically advanced formulas based on innovative ingredients. Power Kera Recharge – who is it for? Power Kera Recharge conditioner, from Pro-Keratin Refill series, provides intensive care for dry, damaged, thin, brittle, dull hair. It works best on hair which needs extreme repair. It is recommended for those whose hair has been destroyed e.g. due to unfavourable weather conditions. Power Kera Recharge – what are the ingredients? Power Kera Recharge contains high quality pro-keratin complex which strongly rebuilds damages inside the hair structure. The action of L’Oreal conditioner is based on amino acids and wheat proteins which are enriched with Incell (particles of lipids which strengthen ceramides of hair). Power Kera Recharge – what effects does it bring? 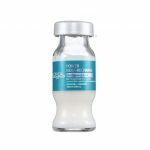 Pro-Keratin Refill rebuilding series is an ampoule treatment. It is meant to be used once a week and help in the restoration of condition and beauty of hair. The combination of advanced formula of conditioning ingredients helps to keep proper hydration in hair and deeply regenerate it. Strands become elastic and smooth as Pro-Keratin Refill rebuilds damaged hair. Power Kera Recharge is the only hair conditioner which protects strands and increases their resilience to damage up to 70%. Power Kera Recharge – how to apply? Apply the product to washed and towel-dried hair. Excess water may disturb the action of Power Kera Recharge. Spray the product on hair, section by section, and massage it. After 5-10 minutes, rinse it thoroughly. After each use take out the applicator and cleanse it. Power Kera Recharge – is it effective? You can read some positive opinions about Power Kera Recharge online. It is praised for pleasant fragrance and satisfactory effects. Regular use of the ampoules makes hair shiny, soft to the touch and even adds some volume. There are also opinions saying that the conditioner may weigh the hair down and make it oily. The effects of treatment are visible after a few minutes; the action is not immediate. Power Kera Recharge – where to buy? Power Kera Recharde for damaged hair is avalable in many online shops and drug stores. You can buy it on the website of the manufacturer. The conditioner is effective but the price seems inadequate to the effect it brings. You must use a few ampoules before you can see any effects. Moreover, the product weighs the hair down. The application is time-consuming. The huge asset of the cosmetic is advanced formula of active ingredients and precise action aimed at a problem. Kerastate creates professional conditioning method in cooperation with the most talented hairstylists from all over the world. Manufacturer believes that everyone has different hair and skin which need individual care. Therefore, the brand promotes individual hair care programmes. Nutri-Thermique Fondant – who is it for? Nutri-Thermique conditioner is designed to meet the needs of very dry and very sensitized hair. It will be perfect for the regeneration of damaged hair. It can also be used as protection against dryness and damage. Nutri-Thermique Fondant – what are the ingredients? Nutri-Thermique conditioner is based on Thermo Intense system which contains three nutrients. The first one is gluco-active, namely carbohydrates, proteins and lipids for effective nutrition of hair. The second one is thermo-reactive polymer which locks nourishing substances inside the hair fibre. The last one is xylose which is responsible for the protection of hair fibre from harmful effects of heat. Nutri-Thermique Fondant – what effects does it bring? Advanced technology of active ingredients provides intensive and durable nutrition of hair. Strands become soft, manageable,, nice to the touch and much easier to detangle. You will see the effects provided that you use the conditioner regularly. Thanks to xylose, hair is protected from dryness whereas nutrients can penetrate inside the fibre, nourish from the inside and condition hair fibre by repairing the damage. Nutri-Thermique Fondant – how to apply? Apply the conditioner to washed and towel-dried hair. It is recommend to apply it to the lengths and ends, massage it thoroughly; don’t apply it to the scalp. Leave on for 3 minutes and rinse with warm water to enhance the action. Nutri-Thermique Fondant – is it effective? According to the opinions on the Internet, the conditioner is not very efficient, has rather unpleasant scent and has very thick consistency. If the product managed to fulfill the manufacturer’s promises, we could turn a blind eye to the troublesome application. The cosmetic softens strands and reduces frizz but the effects are short-term. Users agree that the conditioner makes hair oily, may irritate the scalp as well as doesn’t provide astonishing action. Nutri-Thermique Fondant – where to buy? American Kerastase online shop is the most reliable. You can also buy it in many shops and drug stores as well as online. 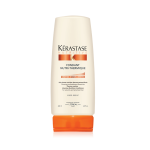 Kerastase Nutri-Thermique Fondant is definitely one of the worst conditioners for such a high price. It brings effects similar to the cheapest nourishing products. The quality is inadequate to the price. The fragrance is not nice, the product is hard to apply. It works but there is no wow-effect; it can even cause irritation. Wella Professionals is a quite popular brand. The name of the company is the synonym of beauty. Wella has been working on technologies and cosmetics for 135 years in order to support women in every-day beauty care. Wella sets new trends in hairstyling almost every season. Wella Elements – who is it for? Wella Elements series, which includes Elements Lightweight Renewing hair conditioner, is designed for professional care of all hair types. The cosmetic is recommended for hair which needs nutrition and protection with the help of natural formula. The conditioner can be used on dyed hair. Wella Elements – what are the ingredients? The extraordinary thing about Wella Elments products is their ingredients based on NuTREE complex. Silicones have been replaced with polimers which serve the same purpose – protect the strands, and make detangling much easier. Ash tree extract provides natural action. The conditioner also contains panthenol and creatine. Wella Elements conditioner is free from sulphates, parabens and artificial dyes. Wella Elements – what effects does it bring? Lightweight hair conditioner has been devised to strengthen hair fibre inside, enhance the regeneration and add vitality. Not only does it repair but also conditions hair. If you use it regularly, your hair is stronger, shiny, smooth and easy to style. Wella Elements locks moisture inside the hair longer, the scalp is alleviated, the strands get great protection from harmful factors (also free radicals). Wella Elements – how to apply? Wella Elements conditioner is applied as any other conditioner. Wash and towel-dry your hair. Apply a small amount of the product to damp hair. Leave on for a few minutes (2-3 minutes), rinse thoroughly, preferably with tepid water. You can use the product on a daily basis. Wella Elements – is it effective? 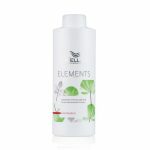 Elements Lightweight Renewing has a consistency of a delicate gel and a very pleasant fragrance. In every review women praise the inspiration by nature which is visible in the ingredients as well as on the packaging. Wella Elements conditioner makes hair supple, smooth and shiny. Considerable improvement in hair condition is noticeable, even in case of serious damage of hair. Wella Elements – where to buy? You can buy the conditioner at Wella online shop, at online shops and drug stores which offer good prices. Wella Elements Lightweight Renewing is very effective, provides nutrition and improved hair condition. Light consistency and fresh scent are the assets of the product. You can see it has been inspired by nature when you take a look at the ingredients. Alterna is a brand that offers professional hair products. It has been on the market for many years. According to customers, Alterna provides expensive and luxury cosmetics. However, it it appreciated for the effectiveness and natural formulas. Alterna products are famous for their high quality ingredients. Making use of natural components is the most important to the manufacturer. Alterna Caviar Repair – who is it for? Caviar Repair is a cosmetic designed mainly for damaged hair, even extremely damaged strands. If our hair is problematic and needs support, Alterna conditioner is recommended. The product can be used by allergy sufferers as the formula is free from sensitizing substances. Alterna Caviar Repair – what are the ingredients? The conditioner contains caviar extract, vitamin C, sea silk and golden root extract. The action of Caviar Repair is based on an innovative technology Enzymetheraphy which rebuilds and reconstructs each strand. It facilitates the penetration of nutrients inside the hair. Another innovative technology of Alterna conditioner is Color Hold, a component patented by the manufacturer. It guarantees high colour protection and increases shine. What is more, Alterna product is free from sulphates and parabens. Alterna Caviar Repair – what effects does it bring? Alterna Caviar Repair has been created to provide instant repair of hair. It intensively nourishes, softens and smooths hair, adds shine and makes the strands easy to style. Additionally, the cosmetic protects hair from harmful external factors, which is possible thanks to an invisible protective layer on the hair surface. The strands are protected from brittleness and damage. Alterna Caviar Repair – how to apply? Apply the product to cleansed and towel-dried hair. Leave on for more or less 3 minutes and rinse with tepid water. Alterna Caviar Repair – is it effective? Caviar Repair conditioner has an orange scent. It is a very efficient product of thick and creamy formula. The application is trouble-free. The effectiveness of Alterna Caviar Repair is confirmed by numerous positive opinions online. The conditioner improves hair condition of hair which is dry both at the roots and the ends. Strands get shiny and soft. The conditioner deals well with frizz caused by dryer or moisture. The formula doesn’t make hair weighed down or sticky. Alterna Caviar Repair – where to buy? Alterna products are available at Douglas. They are also offered by many online shops. Alterna Caviar Repair is surely one of the best conditioners in the ranking. The effectiveness of the product is confirmed by lots of opinions which stress the huge improvement of hair condition. The product has a beautiful fragrance, valuable ingredients and a consistency which makes the application trouble-free. The biggest drawback is the price which is too high.